The reading from Acts 5, which I will be using as my text for Sunday, portrays Peter and John before the Sanhedrin (Council). They've been arrested for a second time because they continue to preach despite warnings to do otherwise. Peter famously declares: "We must obey God rather than humans!" (Acts 5:29 CEB). As I was reading and meditating on the text, I thought of those down through history who have stood up to those who required them to act contrary to the calling of God. The word martyr, which we think of in terms of dying for faith, comes from a Greek word that means "witness." Peter and John stand firm, bearing witness to the good news that Jesus who had been crucified is now risen. They are witnesses to this truth. In thinking of God's call to stand for what is right and true, I must think of martyrs ancient and modern, people who stood firm in their faith, standing up to those who would act unjustly. 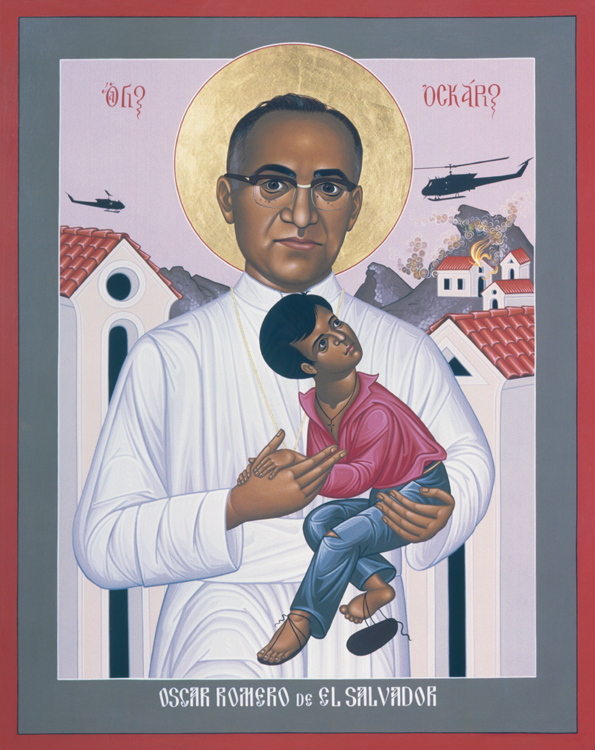 One of those persons was Oscar Romero, the Archbishop of San Salvador (El Salvador), who was assassinated by persons linked to right wing death squads. He refused to back down and challenged the military to do what is right on behalf of the people -- to stop the oppression. It was back during the Cold War, back when the United States was supporting right wing governments as a bulwark against Communism. History has shown we were on the wrong side. Oscar Romero wasn't a Marxist. He wasn't even a liberation theologian. But he was a man who discovered the call of God as Archbishop. I want to share a clip of the ending of the movie Romero, in which we hear Oscar Romero call out the military, and then be assassinated while celebrating the Eucharist.